Learn about the latest offers and our recommendation for domestic travel in Japan. Travel in Japan with JAL's best early-bird discount fares. Subscribe JAL e-News and get the latest and best offers to your inbox. Book hotel and car to earn JMB miles. Enjoy free inflight Wi-Fi on domestic routes. Spring is the time of year when we all get a craving for new things in our lives. Why settle for store-bought when you can make it yourself? Join us as we explore some of Japan's top destinations for hands-on make-your-own experiences! "DeePick Japan" - May lucky cats bring you a lot of happiness and smiles! "DeePick Japan" - World-class artistic view is waiting for you. 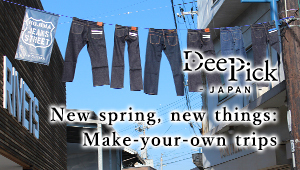 "DeePick Japan" - Venture inside...to discover new worlds! Looking for ideas and deals for your next holiday getaway or weekend trip in Japan? See our well-planned itinerary and special offers covering air ticket, accommodation, car rental and more. Reconnect with nature and experience authentic Japanese countryside life.